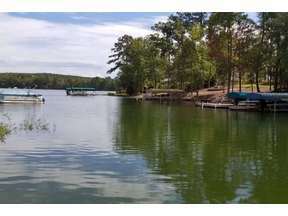 Lake Oconee "Brand New" One of a Kind Lakefront, Farmhouse style cottage w/metal roof. 3 Bedrooms 2.5 Baths, Master on main. Great Room with vintage brick fireplace & gas Logs. 10' Ceilings throughout. Floor to ceiling gliding doors that open full length of wall & brings the outdoors inside. Expansive deck lakeside with wrought iron railings. Handy enclosed storage area underneath deck offers plenty of storage for outdoor machinery, lake toys, etc. Rustic wood laminate floors. Vintage, reclaimed wood accents gathered from local historic establishment adorn the rooms. Custom built cabinets with soft closing drawers. Charming farmhouse sink in kitchen. Solid Brazilian pecan butcher block counters. Granite top center island/breakfast bar. Painted Shiplap wood walls throughout offer a farmhouse ambience. Open floor plan, light and airy. Designer fixtures throughout. Spray foam insulation & encapsulated crawl space affords whole house energy efficiency. Wooden Max Dock included in this price. One of a Kind Property. Definitely need to jump on this one before it's gone.